On May 8, 2007, The Milwaukee Brewers honored former Milwaukee Braves players Eddie Mathews (512 career homers) and Warren Spahn with an induction into the Miller Park Walk of Fame. In the first year of voting, Mathews and Spahn became the first two non-Brewer players to be featured at Miller Park, when each received more than the required 75% of the vote for election. 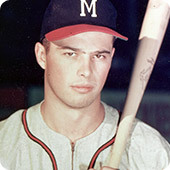 In reading the voting results, Brewers Executive Vice President - Business Operations, Rick Schlesinger, noted that Mathews was the only Brave to play in Boston, Milwaukee and Atlanta. The ballots included on field personnel who wore a Brewers or Braves uniform for a minimum of three seasons but have been retired from playing/managing roles for at least three seasons. Mathews’ family participated in an on-field ceremony, as the Brewers unveil the newest with homeplate-shaped plaques on the Walk of Fame plaza outside Miller Park. Past winners of the award include fellow 500 Home Run Club member Hank Aaron, as well as Rollie Fingers, Paul Molitor, Robin Yount, Commissioner Bud Selig and Bob Uecker.